Our September article featured charts that highlighted the Job Openings and Labor Turnover Survey (JOLTS) and what it may tell us about the direction of the economy. Examining the latest November release, the number of people quitting their jobs rose (to 3,064,000) as did the number of layoffs. 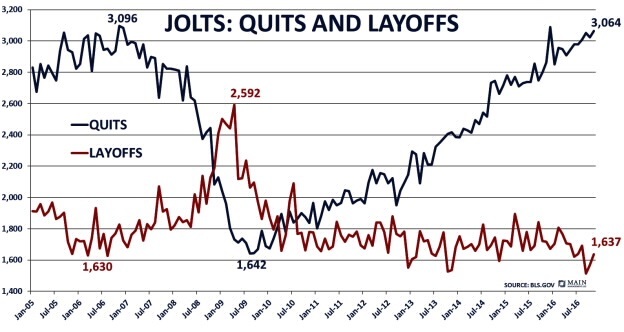 When the number of people leaving their jobs (Quits) increases it’s usually because people are confident in their ability to get another job. Although the number of layoffs also rose to 1,637,000, the trend of people leaving their jobs (arguably for better opportunities) continues to expand relative to the number of people forced out of their jobs (Layoffs). As a result, the labor market continues to tighten, a scenario that typically results in increased wage pressure. Are there actually good reasons for people to quit their jobs to pursue greener pastures? 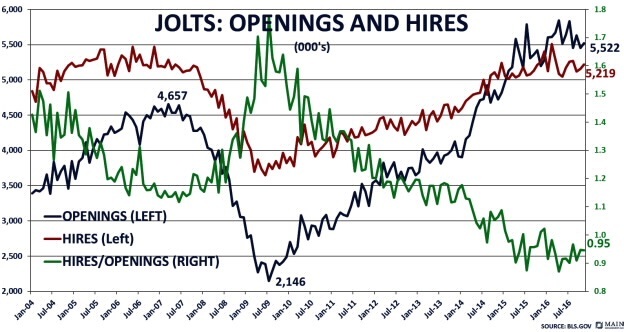 The JOLTS data for November further indicates that both job openings and the number of people hired (Hires) both rose to 5.52 million and 5.22 million, respectively. Year over year the number of job openings is up 6.2% while the number of people hired is actually lower by 0.7%. The ratio of hires to job openings moved lower to 0.95 underscoring that there are more open jobs than positions being filled. As alluded to previously, one of the reasons that job openings do not match the pace of hiring may be a mismatch between the skill set of workers and the type of available job openings. As an example, if one person leaves his job as a truck driver, that person probably wouldn’t have the skills needed for a job opening as a nurse. Turning to the National Federation of Independent Businesses (NFIB) Small Business Optimism Index, it jumped an unprecedented 7.4 points in December to 105.8. The overwhelming common perception appears to be that a Trump presidency will significantly lower regulatory burdens, and potentially corporate taxes as well, factors that likely translates into increased profitability. This is the highest level for the index since 2004. The NFIB further noted that they now see the optimism translating into actual increased business activity, such as capital expenditures. If this indeed continues to materialize, there should be a positive impact to GDP, one that perhaps stretches across multiple quarters. In addition, the University of Michigan Consumer Sentiment Survey jumped to 98.2 in December. 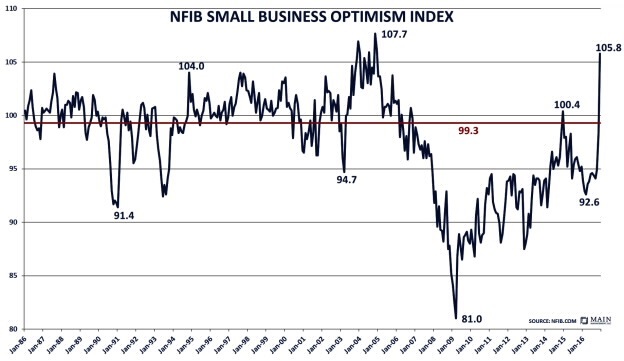 As with the NFIB Optimism Index these are the highest levels the survey has seen since 2004. To underscore the exuberance felt by small businesses, three times as many small firms indicate that now is a good time to grow than what has been historically observed during past expansionary periods. However, this enthusiasm may need to be somewhat tempered by President Trump’s talk of tariffs on trade with Mexico and China. Moreover, rhetoric challenging individual companies in terms of how and where they make capital investments may itself act as a form of regulatory hurdle. A trade war would almost certainly negatively impact GDP. As German Finance Minister Wolfgang Schäuble recently pointed out “protectionism can afford short-term advantages but is almost always damaging in the long term.” Singling out a car manufacturer like BMW for constructing a manufacturing plant in Mexico, while overlooking the fact that their Spartanburg, SC plant is the company’s largest in the world (and employs 8,800 people) may be a dangerous game to play. There are many reasons to suggest that the cabinet members selected by Trump are likely to have a pro-business outlook and likely look to scale back regulation, perhaps significantly. These are positive catalysts for both GDP and the economy as a whole. However, the positive business sentiment might well do an about face if the talk of tariffs does, in fact, become reality. Hafeez Esmail is the Chief Compliance Officer at Main Management, a participant in the ETF Strategist Channel. A pioneer in managing all-ETF portfolios, Main Management LLC is committed to delivering liquid, transparent and cost-effective investment solutions. By combining asset allocation insights with smart implementation vehicles, Main Management offers a unique approach that translates into distinct advantages for our clients, including diversification, cost efficiency, tax awareness and transparency. For more information, visit www.mainmgt.com.